I recently showed the documentary Screenagers and hosted a panel discussion following the film. I have to tell you that the experience, the conversations, and the whole issue of how our kids today are being impacted by their use of phones and social media has shaken me to my core. Truly, I believe this is the greatest issue facing parents today. Unlike the tragedy of drug and alcohol addiction, we cannot shield our children from screens completely as they have become woven into the fabric of our daily lives. They are used for school, for communication, and increasingly for other daily activities (payment, arranging transportation, etc.). I will be facilitating a meeting later this month with my ADHD Parent Coaches so that we can dive deeper into how we address these issues with parents and support parents in addressing these issues with their kids. In the meanwhile, I want to share with you some of my thoughts and insights. • Kids use social media for a variety of different reasons. Before you consider trying to just restrict their usage, it is important to connect with them to understand what they are getting out of the experience, what role it is playing in their lives (keeping up with friends, fear of missing out, entertainment, social comfort, addiction, etc.) As always, start with empathy and a genuine recognition of the challenge. Acknowledge that it truly can be fun using these devices and that you recognize that they are a huge part of socializing and connecting with peers. We must always connect emotionally with our children before we can hope to help them change or try something new. • Consider collaborating to develop a contract that includes the amount of time they spend, when it’s appropriate to use, and where it’s appropriate to use. Keep in mind that you want their buy-in – so working with them is crucial (Reach out to me if you want support in this process). • Remember – model what you preach. 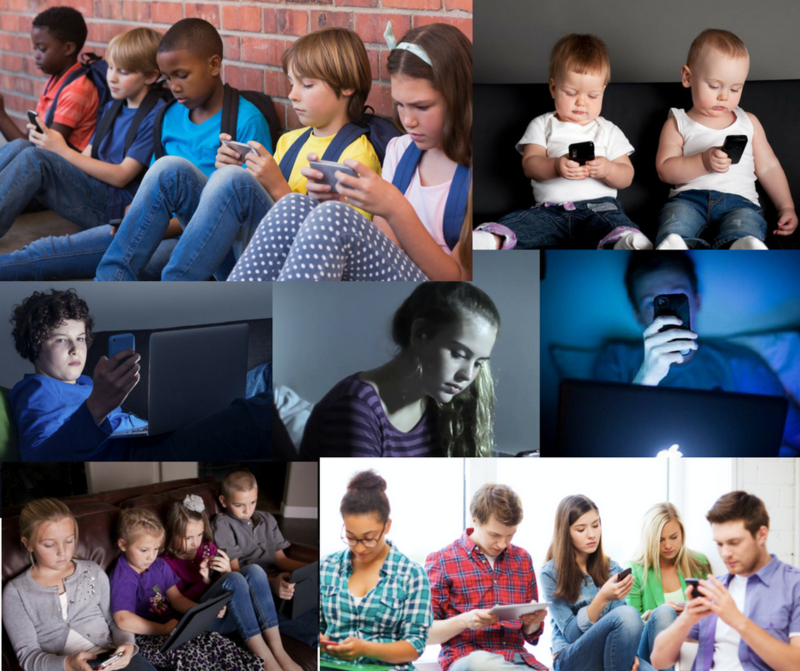 Recognize when you, as the parent, are leaning on these devices to keep your children occupied as an easier solution. I remember that back before we even had the early hand-held devices we used to keep bags of coloring books, crayons, cards, small toys, etc. to play with our kids while waiting for meals in restaurants or for car rides. We played games like connect the dot, I Spy, and hangman. Ideally, meals and car time should be media free. This may be the best (and perhaps only) time you have to converse with your child. • Consider having “no tech” times during homework. Even if your child needs to use their devices during part of homework, there should be some homework time where no devices are necessary. When I do my professional development in schools I have been speaking with teachers about making sure that some of the homework assigned be designated as “tech-free” work. • Violent video games were developed by the military to desensitize soldiers to violence before going to war. I believe this is important to share with children. Positive Change can happen! MIT psychology professor Sherry Turkle explains in the Screenagers film that, “The research shows that human resiliency gives me hope. Children for even five days without their devices, in tech-free camps, on measurable tests, have restoration of the capacity for empathy.” The UCLA study can be found here. At a minimum, I encourage you to create a weekly routine that includes at least four to five hours of no tech time (personally I would go for 24 hours – but sometimes you need to start small!). • Explain to your children that Multitasking is not possible effectively. Research has shown that the brain isn’t actually capable of managing two cognitive tasks at the same time. You may feel better assuming you are getting more done, but you are actually performing worse on each task. • For parents of younger children where you can still closely monitor playdates, I recommend creating a pact with the other parents that certain time will be “screen free”, regardless of whose home the playdate is in. Parents must work together to create a culture of support. There is much that needs to be done to raise awareness of the impact these issues are having on today’s youth. I am committed to helping make a positive difference through education and support. Please “LIKE” my PTS Coaching Facebook Page for further news and tools.